Like closed sales and ROI, company culture is a reliable predictor of successful business performance. And like any revenue driver, it should be analysed and developed. In the noughties, a bunch of smart guys published books about how organisations with strong company cultures heavily outperform those without. At the time they bordered on maverick. Now, of course, the evidence in favour of the theory is manifold, and pretty much every leader is keen to create a successful culture of their own. For brands like Zappos and Red Bull, culture is the ultimate talent attraction tool – not only as a point of differentiation against competition, but also as a means of filtering out those unsuited to their organisations. For these brands’ employees, the culture is the driving force of their motivation and performance. Employers can no longer assume their employees are, to quote every losing contestant on The Apprentice, ‘grateful for the the opportunity’. Now it’s the employer’s turn to be grateful, and to create working environments that help people to succeed for the duration of time they decide to stick around. Here are a few pointers to help you build a culture to support that environment. How do conflicts arise, and how are they solved? How do senior leaders interact with middle managers and employees? How do middle managers interact with reporting employees? How do employees interact with managers and senior leaders? What do you think of the office environment? What do you think of our team bonding activities outside the office? What would you tell a friend about us before they started working here? What do you think of our working hours? Do we offer enough benefits – entertainment discounts, meals out, etc? What is the one thing you would most like to change about the organisation? What is your favorite thing about working in the organisation? Who within the company do you admire? Why? How do you feel about the reward and recognition culture within the organisation? Pull together champions from each department of your organisation to craft a pithy one-liner that expresses exactly what your organisation is trying to achieve. Try to use plain English, and avoid industry jargon or cliché. It can be as ambitious as you desire, as long as it’s plausible. If your mission is your North Star, company values are the tools that will get you there. Defining a unique set of principles that will guide everything you do is a critical step in creating a successful culture. While these are unique to Zappos, the below examples are stable values that you could steal for your organisation. Whichever you choose should reflect what’s important to your organisation, and what employees should expect from the environment. This is why the best businesses often have the most rigorous recruitment policies. They realise that the perfect candidate possesses far more than the hard skills required to do the job, they also have the right character traits, attitudes – even sense of humour. The leader then becomes less a decision maker and more an enabler. Don’t try to show how clever you are, try to show how clever your people are. Focus on building great leaders among your people. People hang around at cultures they like, so while the fanatical recruitment processes pose hurdles, it’s worth it when it comes to the savings on recruitment and retention alone, not to mention boosted productivity and performance. In a recent study of ours, two thirds (66%) of UK employees agreed that regular personalised benefits would be appreciated as recognition for their loyalty and personal investment. Our sample of 2000 UK workers agreed that career development opportunities and relaxed working hours are among the perks that would drive a happier company culture. The simplest way about this is to ask your employees which perks they would like to receive. This also works on a recruitment level. Before hiring a candidate, research their demographics to find out what motivates them in the way of perks. It’s a broad stroke of the brush, but millennials are consistently proven to value work-life balance and development opportunities unlike older cohorts (generation X and Baby Boomers) whom value the salary and more traditional benefits. Download our new eBook on the topic, it’s good. 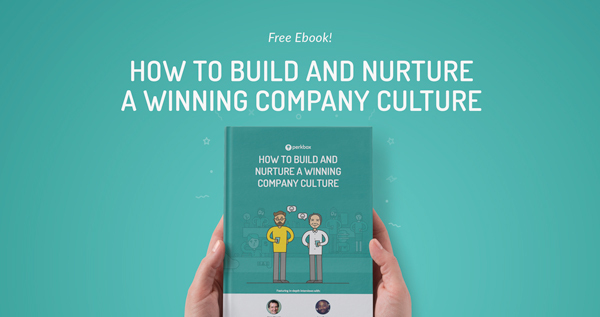 It explores how defining and nurturing a winning company culture can attract the very best talent, while boosting employee productivity and morale. And you can download here for free.